Adam Keawe Manalo-Camp is a Hawaiian historian, human rights advocate and artist. He shares his knowledge, wisdom and unique perspective on history and modern life in Hawaii. The ʻahuʻula (mantle or cloak) of Kamehameha I was (and still is) the ultimate symbol of Hawaiian kingship. A cloak of pure yellow–yellow and red being sacred and royal colors–was only worn by those with the highest ranks in Hawaiian society. Like all ʻahuʻula, it has itʻs own name. The ʻahuʻula is composed of 450,000 feathers. Some people think that Hawaiians caught birds and plucked away their feathers and killed the birds in the process–which was not true. A maximal of 5 feathers could be plucked per bird and birds were released as much as possible in order to ensure their future generations. In addition, after the conclusion of every battle, it was customary that winning chiefs would dismantle the feather cloaks of the losing party and use their feathers to add their the victorsʻ cloaks thus feathers were re-used. The ʻahuʻula of Kamehameha I was present at the swearing in or the coronation of every Hawaiian monarch (including King Lunalilo) except for Queen Liliʻuokalani though the Queen is photographed with the feather cloak in several of her official portraits. King Kalākaua added a purple velvet collar piece to the cloak for his coronation in order to protect the feather work. In the Kingʻs coronation, the feather cloak is donned before the wearing of the Crowns and is given a special ceremony within the coronation ceremony. Queen Liliʻuokalani removed the purple piece and was the first monarch to allow the cloak to be displayed to the public in the Hawaiian National Museum as she believed that ultimately the cloak is not merely worn by the Monarch him/herself but by the entire lāhui. 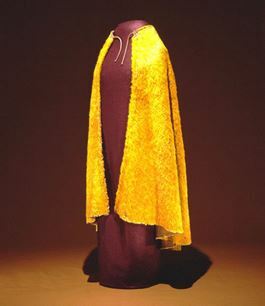 This was controversial at the time as this ʻahuʻula in particular was a sacred object but the Queen felt that by displaying the cloak, it would democratize the Monarchy and would signify that the kuleana of Hawaiian nationhood does not belong to the wearer of this cloak alone but to all Hawaiians. Mahalo for sharing your knowledge with us!